For those who have read my blog before you will know that I enjoy listening to music on my iPhone while I run. 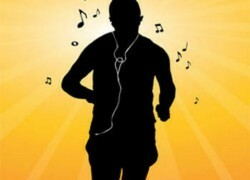 The iPhone has two functions – one is to track my run and the other is to feed me music that will help me keep my rhythm. Everyone has their own inspirational songs that help motivate them while training, and sporting teams across the world are known for using music as a motivational tool. Whether it’s heavy metal, techno, hip-hop or rock anthems, I’m sure you can think of one or two motivational songs that help give you that extra push when you need it. Research indicates that the speed of the tempo has the ability to increase the speed of runners and improve running times. You want to run faster, choose music with a fast tempo. When I choose my music it is all about the beat, but it also needs to be something that is good to listen to – otherwise it would just be torture – imagine running two hours listening to music you can’t stand. Now, you must get the tempo right, if you get it wrong and it can completely throw your run out. For example, if you are heading off on a long run you don’t want the music to be a fast tempo at the start as this could make you go too hard too early and burn yourself out. So match the tempo of your songs in your playlist with the tempo you need for your run. Or create a diverse playlist so that if you need to change tempo you can just fast forward one or two songs to find the speed you need. This is my preferred method so if I’m hitting a hill, I go to a faster song, if I’m cruising at a preferred speed I settle into a mid speed tempo. If I’m running intervals – crank it up! Listening to music also drowns out the sound of my breathing, which can be a little distracting especially when I’m struggling up a hill and labouring. Big warning when running and listening to music. Don’t have the music so loud that you can’t hear traffic (for obvious reasons) or bike riders who may share the running trail. You need to be able to hear what’s around you. It is said that a relaxed pace for running is when you can hold a conversation while you are running. Now if you are running by yourself, you may substitute the conversation with singing along to your playlist. If you are tone deaf and can’t sing – you might frighten kids on the street or start dogs howling through the neighbourhood or even worse, get a fine for noise pollution. If you haven’t run while listening to music – give it a try and see if it helps. If you do – share your playlist as I’m always on the lookout for new songs! I’ve got 14 weeks to go before the big race and still tracking ok to the program and feeling alright. My fundraising for the Fight Dementia campaign (you can check this out at http://www.everydayhero.com.au/graham_plant ) is going really well/. Big thanks again to everyone who has checked out the site or donated to the cause – very much appreciated!!! This entry was posted in Fight Dementia, Fund Raising, Marathon Training and tagged alzheimer's, dementia, endomondo, fight dementia, fundraising, marathon, music, playlist, runners, running, running music, training. Bookmark the permalink. Total agree. I’m currently listening to the Ministry of Sound Summer Running Trax. Nice DJ mix of current music at a consistent tempo. Will add these to my list – thx for sharing. Happy Running! !